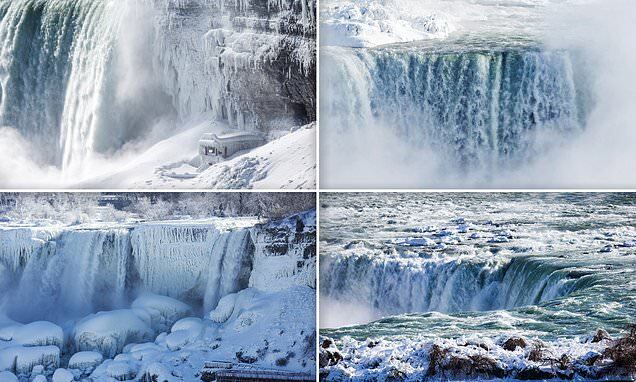 New pictures of Niagara Falls show the attraction looking like a set straight out of Disney film "Frozen." Temperatures in Ontario, Canada, have dropped to minus 18 degrees Celsius, resulting in the Falls looking even more photogenic than they did earlier this month when they first froze over. Elsewhere in North America, Chicago has been hit particularly hard by the polar vortex, with video showing Lake Michigan frozen over. There's also footage of the Chicago River locked in a deep freeze— a boat can be seen making a path through the ice as it goes. Average temperatures in Chicago have plunged to -17C, making it the second coldest day on record in the last 150 years. Locals have been told "not to breathe too deeply outside" due to the extreme cold. Closer to home, parts of England and Wales are on amber alert after the Met Office warned of potential snow and icy conditions until 9 p.m. on Friday. Oddly, this was right after Elsa was in town touring with Disney on Ice through Buffalo.